Mablethorpe Athletic were stunned by a dramatic fightback as All-Star Panthers scored late goals to win a thrilling Town Trophy tie. All-Star Panthers trailed 3-1 going into the final 10 minutes, but struck three times to book their place in the next round. Mablethorpe began brightly and Courtney Skeldon raced clear only to be chopped down by Andrew MacTaggart who was the last defender. A free-kick just outside the box was awarded, but no red card was shown much to Athletic’s frustration, particularly when the set piece came to nothing. Panthers improved after their early let-off with Tom Nicholson, Drew Rhoades and Callum Blythe all going close. 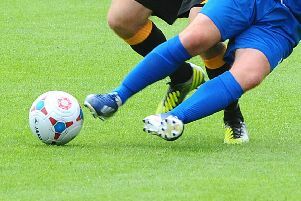 But Mablethorpe broke the deadlock when Lee Twigg’s long-range effort hit the woodwork and Skeldon tapped in the rebound. Panthers responded with Blythe forcing James Ryan into a great save before William Sinclair curled a free-kick just wide on the stroke of half-time. Blythe equalised with a powerful shot early in the second half, and Rhoades then went close for the hosts before Blythe forced Ryan into a good save. Mablethorpe restored their lead when Adam Brownson latched onto Paul Mail’s throw-in and fired past Sean Swinscoe. Soon afterwards Swinscoe was lucky not to concede a penalty for upending Adam Cannon in the box, but Skeldon made it 3-1 in the 74th minute, heading in Marcus Mackay’s pinpoint cross. The game looked up for the Panthers, but they never gave up and hope was restored when Kurt Grantham pulled one back, shortly after Hayden Graves had been denied by Ryan’s terrific save. Just four minutes later, Charlie Campbell bundled in William Sinclair’s free-kick to level, and in the 89th minute Mathew Sirett was adjudged to have handled a cross inside the area. Blythe converted the penalty to complete an astonishing comeback. Mablethorpe manager Mick Stubbs said “It was a hard result to take and I thought we deserved to win. “For me they should have been down to 10 men after the early challenge on Courtney Skeldon. Adam Cannon should have had a penalty for us and their penalty at the end was another poor decision. “When we were 3-1 up it looked promising, but credit to Panthers for their late fightback. “The lads deserved more from a good team performance. They all played well – particularly Alex Carter and man-of-the-match Courtney Skeldon. Mablethorpe (4-4-2): Ryan; Thomas, Sirett (c), Carter, Mackay; Brownson, Mail, Quinn (Billingham 48), Twigg (Bebbington 46); Cannon, Skeldon. * On Saturday, Mablethorpe travel to AFC Louth in the league (kick-off 1.45pm).